Here is a photo of Saint George's Church, in my hometown of Affton, Missouri. The church is on the top of the far hill. 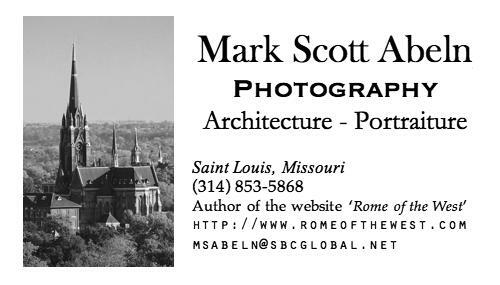 The photo was taken from the City of Saint Louis, about a mile from the church, and is looking down Gravois Avenue, across the valley of the River des Peres. Click on any photo for a larger version. 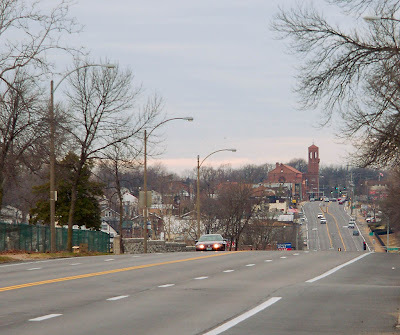 Gravois Avenue is one of the oldest highways in the state of Missouri, dating before 1804; it starts by Soulard Farmer's Market just south of downtown, cuts diagonally across the city, ignoring the street grid plan, changes its name in Saint Louis County to Gravois Road, and extends far out of the area, ending in Saint Clair, Missouri. Gravois is a French name meaning 'gravelly', and is pronounced Gra-voy. 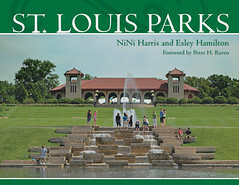 The name comes from Gravois Creek which it bridges at Grant's Farm, the site of "Hardscrabble", home of Ulysses S. Grant, the Civil War general and President of the United States. 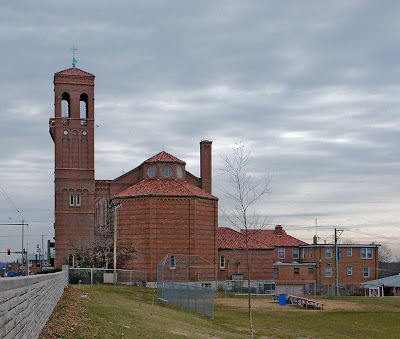 Also on Gravois is the Saint Francis de Sales Oratory, site of one of the Traditional Latin Masses in the city. Affton was home to prosperous German farmers, who moved into the area previously settled by poor subsistence farmers of English and American Indian descent, and large slave-plantations of the French. Several Lutheran churches are also in Affton, reflecting the mixed religious heritage of the distant German homeland. 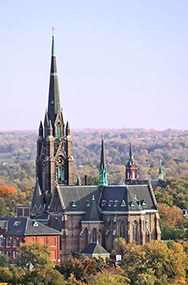 The church sits prominently on a hill, and from that hill, on a clear day, downtown Saint Louis is visible, nine miles away. One mile further down Gravois is a tavern, named appropriately the Ten Mile House. Click on the photo, and in the lower left corner, just below the stop light, you can just barely see the Gateway Arch. 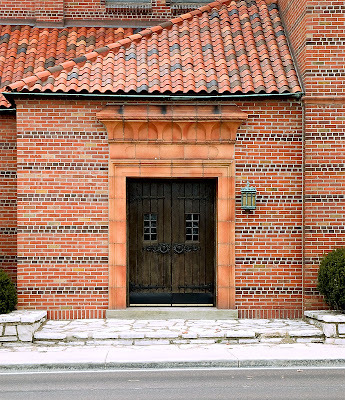 The church was built in 1917, and is the oldest Catholic church in Affton. The community at that time was largely made up of German truck farmers who grew produce for the Saint Louis markets, and this neighborhood is called "Gardenville". After the Second World War, Affton developed into a bedroom community, and two more Catholic churches were built in the area: Seven Holy Founders and Saint Dominic Savio. 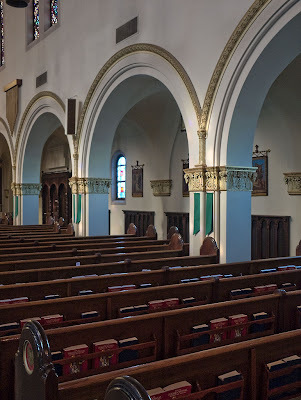 A former Benedictine Monastery nearby is now Affton's Saint Mark parish. The northwest entrance to the church. 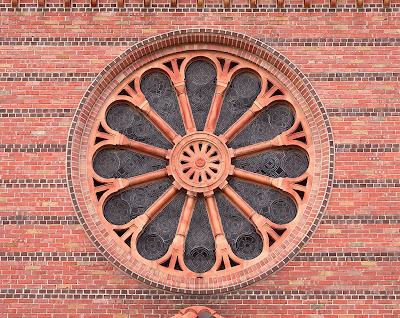 The church itself is of Italian design, of brick construction and clay tile roof. 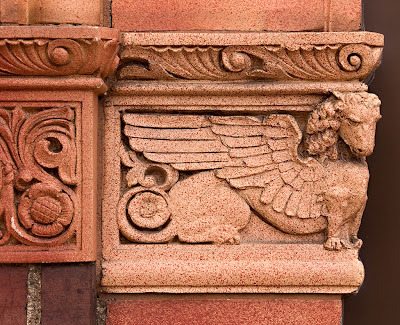 The brick, however is not done in the Roman style, but is in the common shape and color as used in Saint Louis construction since the early 19th century. These bricks were almost certainly made locally; Affton had a major brick factory until the 1960s, and it was just one of many that used to exist in the Saint Louis area. Soils here are made of hardpan clay that developed directly from the slow erosion of the underlying rocks. Some traditionalist architects say that buildings ought to appear as if they sprung directly from the surrounding ground, and that is most certainly the case here. The main door of the church, on the northeast corner. This multicolored brick was in common use in Saint Louis until at least the 1950s. By the 1970s, brick used here for construction was uniform in color—a dark red-brown— and lighter in weight. Detail next to the main door. This is a gryphon; a creature with a body of a lion and wings and head of an eagle. This is a symbol of Christ in both His earthly and divine natures. The east door. 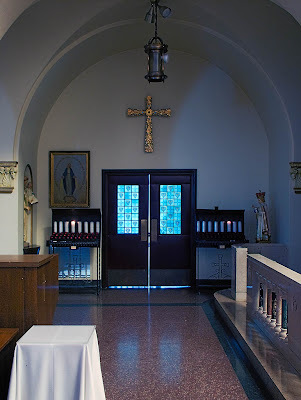 To the left, under the black canopy, is the entrance to the perpetual adoration chapel. Pottery representation of a winged lion next to the door. This is a symbol of Saint Mark the Evangelist. 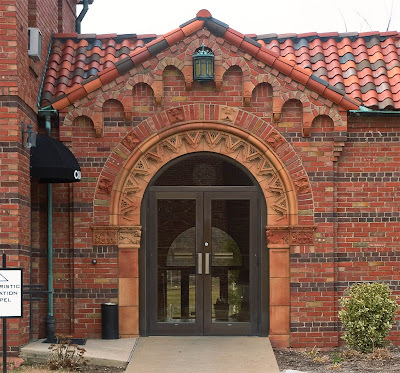 This clay decorative pottery is similar in color and design used at the Carmelite Monastery, located a number of miles away in Ladue, Missouri. The nave of the church, looking towards the altar. The interior appears to be original, with the exception of the altar, which is versus populum. 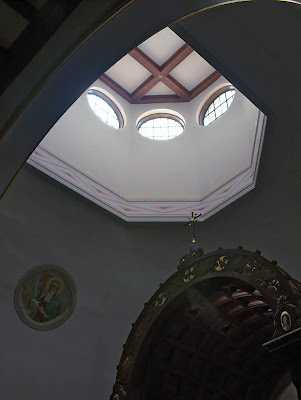 A view of the half-cupola in the apse; the clear-glass windows give indirect natural lighting to the sanctuary. 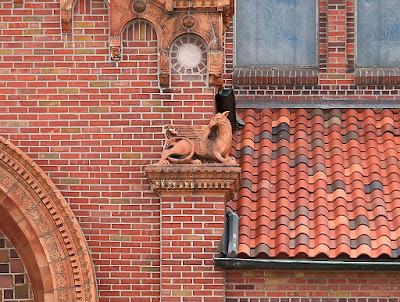 Even this architectural detail is ornamented. 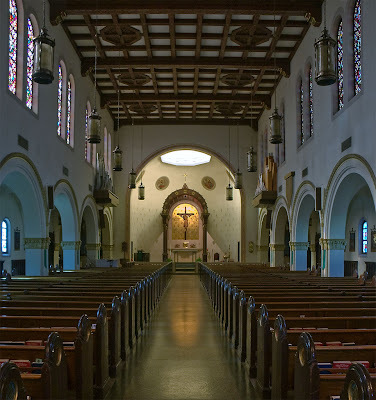 The church is a traditional basilica design, with side-aisles. 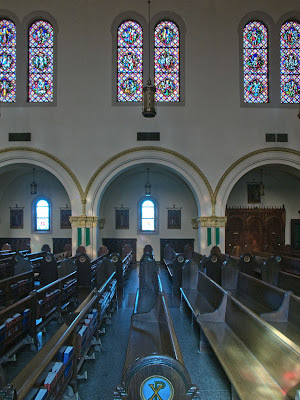 Sunlight filtering through the stained-glass windows illuminates the pews on the right. Another view of the side of the nave. 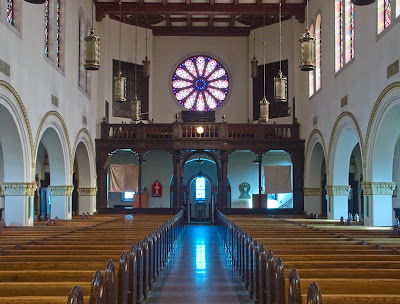 A view to the back of the church, with the rose window at top. The yellow circle in the middle is a clock; the first one I've ever seen in the main body of a church. The River des Peres, at the bottom of the hill from the church. Catholicism in Saint Louis started near here, when Father Marest set up a mission for the Kaskaskia tribe in 1700. 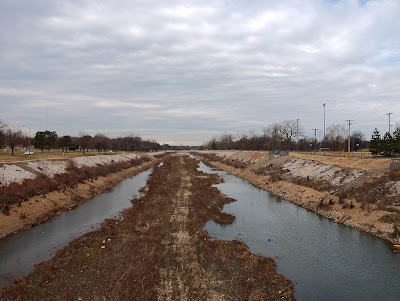 It isn't a natural stream anymore, but was set into a channel, starting in the 1920s. But nature is reclaiming the works of man, and the once bare concrete bottom is now covered with a thick layer of soil, providing a foothold for water-loving plants and even willow trees. Water now flows perpetually in this lower stretch of the river, and shorebirds can be seen fishing here. 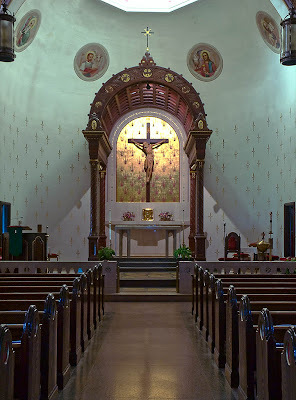 Great story and Photos on the landmark St. George church. The beauty of all good work is in the details. The photos on this website are stunning. You must be a professional photographer. No? I'll be willing to take photos for hire! Your pictures of the church are great! Thank you for promoting Affton. Too few of us do it. I'd appreciate your support. father seibert had the church built to resemble the architecture he saw first hand when in italy (perhaps while in rome, i forget the circumstances). architecturally, st andrews in lemay has a lot in common. 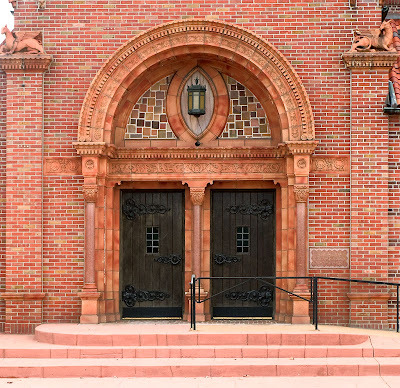 The stonework at the northwest entrance to the church and the main entrance (original stonework replaced here) and the stonework around the exterior statues was done by my uncles, John and Tom Zlatic. Nice to run into a grade school friend online. Although I still live the area, haven't been to the church in many years. One of the posts here mention the name "Zlatic" - I recall a Mary Ellen in my class....possible relation? Thanks, Mark. The New Busch Stadium - Is it Ugly?